The National Museum of Rural Life lies south of Glasgow, in the Central Belt and is a part of the National Museum of Scotland. It has been built up on what was formerly a working farm, and so in many ways is quite the opposite of the Highland Folk Museum. This is an agricultural museum, with artefacts which more reflect the southern arable farming community than Highland crofters. Here, there are tattie sculls, besoms, frame baskets, fruit baskets, a woven child’s riding seat, along with a variety of ropes and a rope twister. There are also, intriguingly, a variety of excellent Shetland basketwork, including one of the few rivva kishies from outside Shetland. The basket-maker who accompanied me to this museum was Lise Bech. Lise lives not so far from the museum and has had a long-standing relationship with it. 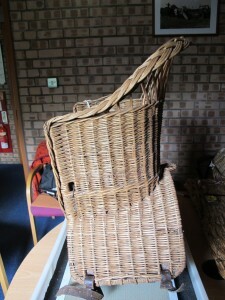 She knows the basket collection well, and has supplied the museum with a selection of willows for their willow patch. I took a long, but very reasonably priced, bus journey from Glasgow, which dropped me right outside. The curator, Elaine Edwards, used to work full-time at this museum, but now divides her time between here and the main National Museum. She was again very helpful. The stores were very impressive, state of the art, and the baskets were very easy to locate and view. The tattie sculls were a mixture of spale baskets (made from split wood) and others made from split rattan. This is the first time I have seen examples of tattie sculls, as opposed to archival photos of them. Perhaps because they are so work-a-day, there are very few in collections, although Julie has also seen some in Dumfries Museum. Two tatties sculls here also had handles. 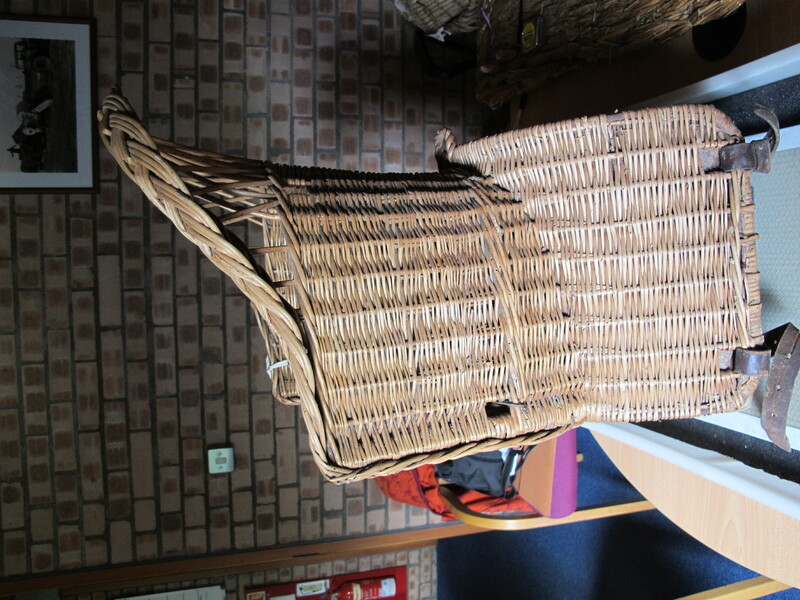 One of the highlights of the collection was the child’s riding seat, very impressive and very well woven. 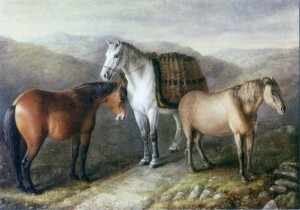 There was also a Shetland flakkie, which is a straw pad for putting on a pony’s back under the wooden saddle or klibbers. Lise is very knowledgeable about Shetland baskets. This one, she said, was made from Shetland oat straw (avena strigosa) or gloy, and woven with rush twine binding (floss simmens). The same technique was used to make hanging doors in cattle sheds to keep out the draught. Lise also drew my attention to the rivva kishie in the Museum display, which comprised a pair of kishies or panniers, also woven from gloy, which were hung from the klibbber or wooden saddle in a pair of maishies, or nets made from rush rope. All these Shetland items had been collected in the early 20th century by Evelyn Baxter, who also made the main collections for the National Museum (see also People section and Leith Customs House items on the Blog). Before we left, we walked around the museum and Lise brought me to view a wonderful painting of West Highland ponies by William Shiels, shown carrying peats in creels, very similar in form to those collected by Isobel Grant for the Highland Folk Museum. 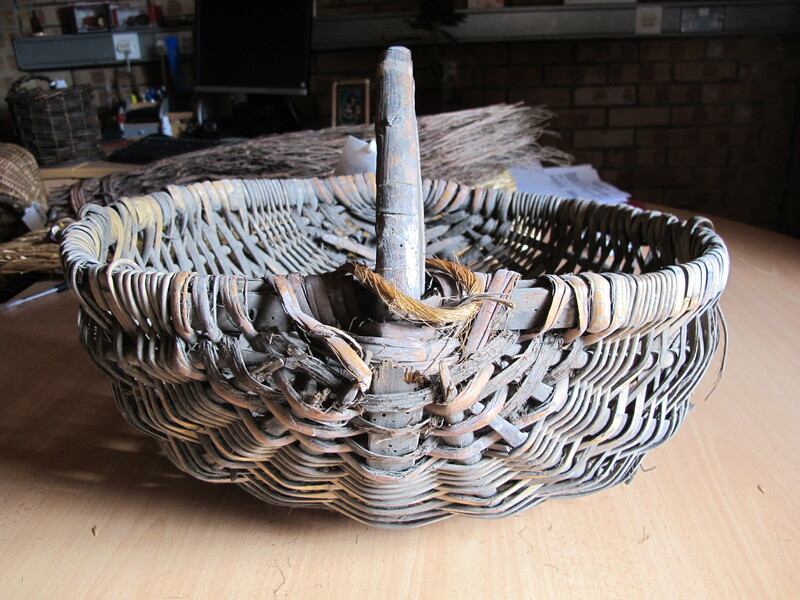 Each visit adds new dimensions to the interwoven basket community of Scotland, and so many of the insights are provided by today’s basket-makers. Thanks Lise.